Marlo has a home! 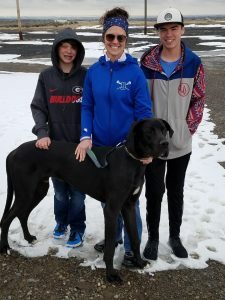 - Rocky Mountain Great Dane Rescue, Inc.
Marlo has a home with Lana, and her 3 sons in Utah! Marlo will be the family’s first Great Dane, but they are no strangers to the breed, as Lana’s in-laws have always owned them. Marlo will share his home with Deuce, a young-at-heart 9 year old Pudlepointer, and 3 human brothers, JP, Sterling, and Graham. The family loves to go hiking, take walks around the neighborhood, and go on camping trips, and they plan to take Marlo everywhere they go! Marlo and Deuce will have plenty of play time, as Deuce really needed a little brother to keep up with his “puppy like” energy. Marlo will be a busy pup with his new family! Way to go sweet boy!